Learn What Big Action Star Will be in the next ‘Fast and Furious’ Film!!! It’s amazing and causes me to have headaches to write about more ‘Fast and Furious‘ movies. I don’t get the draw here at all besides Dwayne ‘The Rock’ Johnson slumming it to be in these horrid films. However, there have been quite a few of these movies and there is at least going to be two more films. So, with that said, according to the good folks over at Aintitcool, this upcoming ‘Fast and Furious‘ film will be the 6th installment, with the 7th movie being filmed directly after. Kind of like how Peter Jackson filmed the ‘Lord of the Rings‘ trilogy. Well, there is a major reveal at the end of the 6th one, which will catapult the franchise into the 7th film. **SPOILER ALERT** If you don’t want to know some majore plot points and characters for the next two films, then I suggest stop reading here and click the home button on the top left corner and read another article, so you can wait to May and be surprised. So, we hear that at the end of the upcoming ‘Fast and Furious‘ film, the entire gang has assisted Hobbs (The Rock) in taking down Owen Shaw (Luke Evans), which gets the entire gang off the hook and finally getting to head home with all the big stars ready to live happily ever after, or do they? DUM. DUM. DUUMMMMM. Ready for the big reveal which we don’t know if it will come during or after the end credits or at the end of the film? The scene in question focuses on a mystery driver in a Mercedes where we hear someone on the police scanner speaking in Japanese. There is a big car chase at high speeds and is calling for tons of back-up. The mercedes kicks it in to high gear and takes off to get involved in the high-speed pursuit. Once the mystery driver and his Mercedes enters the chase, the mysterious driver slams his Mercedes into one of the cars, sending the car spinning upside down. The mystery driver gets out of the car. That driver is none other than Jason Statham, who will be playing Owen Shaw’s older brother Ian, who then walks up to the car and sees Han (Sung Kang), which tells us that it’s ‘Tokyo Drift‘ time. Holy god. I can only imagine that fans of the film are going to freak out when they see this. I’m not impressed, but who is really? 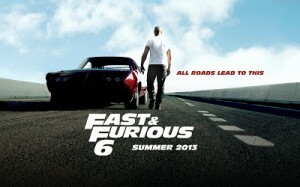 Film Review: ‘Fast & Furious 6’!! This entry was posted on Tuesday, February 19th, 2013 at 12:52 am	and is filed under Film, News. You can follow any responses to this entry through the RSS 2.0 feed. You can skip to the end and leave a response. Pinging is currently not allowed. « Thomas Lennon Joins Sean Hayes’ New Comedy Series for NBC!! !